"We are close to a historic turning point at the continental level. I am astonished at the stupor of a political left that now exists only to challenge others and believes that Milan should not host the president of a European country, as if the left has the authority to decide who has the right to speak and who does not -- and then they wonder why no one votes for them anymore." — Italian Interior Minister Matteo Salvini. "This is the first of a long series of meetings to change destinies, not only of Italy and of Hungary, but of the whole European continent." — Italian Interior Minister Matteo Salvini. "We need a new European Commission that is committed to the defense of Europe's borders. We need a Commission after the European elections that does not punish those countries -- like Hungary -- that protect their borders." — Hungarian Prime Minister Viktor Orbán. Hungarian Prime Minister Viktor Orbán and Italian Interior Minister Matteo Salvini have pledged to create an "anti-immigration axis" aimed at countering the pro-migration policies of the European Union. Orbán and Salvini are seeking a coordinated strategy ahead of the March 2019 European Parliament elections to defeat the pro-immigration Party of European Socialists (PES), a pan-European party representing national-level socialist parties from all EU member states. The objective is to change the political composition of European institutions, including the European Parliament and the European Commission, to reverse the EU's open-door migration policies. "Today begins a journey that will continue in the coming months for a different Europe, for a change of the European Commission, of European policies, which puts at the center the right to life, work, health, safety, all that the European elites, financed by [billionaire Hungarian philanthropist George] Soros and represented by Macron, deny. "We are close to a historic turning point at the continental level. I am astonished at the stupor of a political left that now exists only to challenge others and believes that Milan should not host the president of a European country, as if the left has the authority to decide who has the right to speak and who does not — and then they wonder why no one votes for them anymore. "This is the first of a long series of meetings to change destinies, not only of Italy and of Hungary, but of the whole European continent." "European elections will be held soon, and many things must change. At the moment there are two sides in Europe: One is led by Macron, who supports mass migration. The other side is led by countries that want to protect their borders. Hungary and Italy belong to the latter. "Hungary has shown that we can stop migrants on land. Salvini has shown that migrants can be stopped at sea. We thank him for protecting Europe's borders. "Migrants must be sent back to their countries. Brussels says we cannot do it. They also said it was impossible to stop migrants on land, but we did it. "Salvini and I, we seem to share the same destiny. He is my hero." "If they wanted to see me as their main opponent, they were right to do so. It is clear that today a strong opposition is building up between nationalists and progressives and I will yield nothing to nationalists and those who advocate hate speech." "From the beginning of 2017 to the present day, the France of 'do-good Macron' has rejected more than 48,000 immigrants at the Italian border, including women and children. Is this the 'welcoming and supportive' Europe that Macron and the do-gooders are talking about? "Instead of giving lessons to others, I would invite the hypocritical French president to reopen his borders and welcome the thousands of refugees he promised to take in. "Italy is no longer the refugee camp of Europe. The party for smugglers and do-gooders is over!" "To win [the Italian elections] we had to unite Italy, now we have to unite Europe. I am thinking about a 'League of the Leagues of Europe,' bringing together all the free and sovereign movements that want to defend their people and their borders." 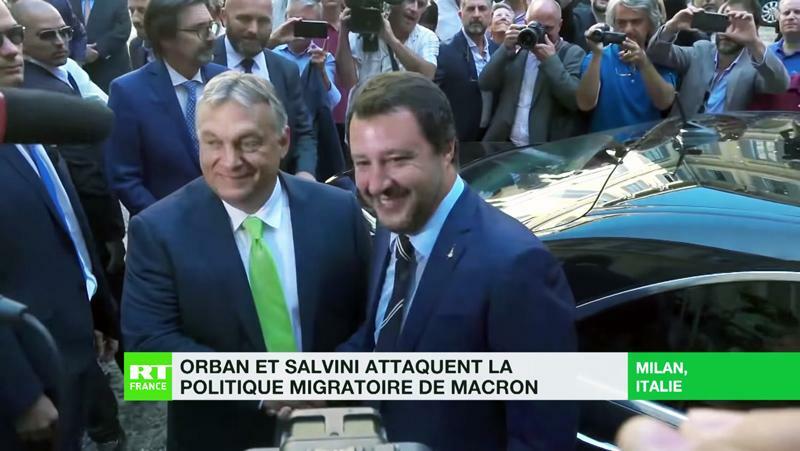 Salvini proposed that the network include Austrian Chancellor Sebastian Kurz, Dutch Freedom Party leader Geert Wilders, France's National Front leader Marine Le Pen, and Hungary's Orbán, among others. He also said that the European Parliament elections in 2019 should be a referendum on "a Europe without borders" versus "a Europe that protects its citizens." "We must protect what our ancestors built for more than a thousand years. It is not a slogan, it is a fact." Salvini's embrace of Orbán has also exposed differences in Italy's ruling coalition, comprised of Salvini's League and the populist Five Star Movement (M5S) led by Luigi Di Maio. "If tomorrow nothing comes out of the European Commission meeting, if they decide nothing regarding the ... redistribution of the migrants, the whole Five Star Movement and I will no longer be prepared to give €20 billion euros ($23 billion) to the European Union every year." "Countries that do not participate in relocation and which do not even deign to respond to Italy's request for help, should no longer receive European funds from us, and among these at the moment, is Hungary." "Orbán's Hungary raises barbed-wire walls and refuses migrant allocations. For those who do not accept the allocation, they should not be entitled to European funding." Salvini defended Orbán: "I respect Hungary's absolute right to defend the borders and the security of its people. The shared objective is the defense of external borders." Orbán replied: "We need a new European Commission that is committed to the defense of Europe's borders. We need a Commission after the European elections that does not punish those countries — like Hungary — that protect their borders."